News :: Teaching Kids to Ride - Glide Bikes - Balance Bikes for 18 months to 10 years old! our balance bikes, because that is our ultimate vision. We want you and your child to have an easy and productive bike learning experience where teacher and student are both at ease and enjoying the process. Balance: It shouldn’t be work! Glide Bikes design their balance bike to be an intuitive tool for teaching balance. Apart from some of the initial explanation of how to use a balance bike (using your feet on the floor to power and generate momentum, then lifting your legs to glide) our bikes were designed to teach your children without too much parent intervention. 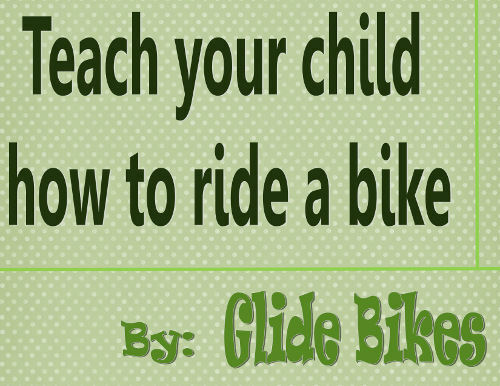 With a Glide Bike you don’t need to hold on to the bike seat to help stabilize your children’s initial take-off. In fact, you shouldn’t be stabilizing your child’s seat at all! The whole point is to help your child learn to balance on their own. When you start to intervene in that way you minimize their ability to test out how to move their body with the bike to keep them upright! Allowing your kids to test out what the bike does when they move in certain ways creates a connection and development between them and their bike. Once your child has experimented with the best ways to move the bike around they’ll gain confidence and begin increasing their speed and movement. The whole idea of our Glide Bike is to let kids learn at a pace where they gain confidence and skills while having fun! Eliminating the training wheels grants your children that critical knowledge of how to stay upright on a traditional bike from the beginning, and minimizes the fear and buildup that usually happens when you first take the training wheels off. Venturing on to a pedal bike for the first time will be a breeze for your Glider Rider who has already developed not only the skills, but the confidence to fearlessly take off and go! Teaching your kid to ride a bike is a process of discovery between child and bicycle. Through this progression however, your child will need to determine what works and what doesn’t with minimal parental intervention. The experimentation may lead to moments when your children could falter or even fall off the bike. Don’t fret! Glide Bikes are designed to be low to the ground and light-weight, creating minimal discomfort in the event of a fall. Our best advice in the event your child does take a tumble is to encourage and applaud their efforts, creating a positive and open opportunity for them to get back on the bike and try again. Running to a child’s aide and amplifying the misstep may increase a child’s fear and create difficulties for the child to continue excelling throughout the bike riding process. With a Glide Bike as an aide in teaching your child how to ride a bike, you can expect a quicker, easier and a more fun experience with your child and their bike riding journey. Thanks for your interest in a Glide Bike and we look forward to seeing more young Gliders on the sidewalks and neighborhoods learning their way around on two wheels!